octr202 wrote: There is no US commuter rail system with a traditional fare collection system using smart cards. Some west coast systems (Caltrain and Sounder, not sure if others do yet) accept their regional cards, but even if they don't have vending machines at every stop, they do have to have validators for tag on/tag off at every stop, thus certainly requiring much of the infrastructure to put in TVMs anyway. They also have (in addition to far fewer stations to worry about) a completely different fare system, since it's proof-of-payment with roving inspectors and random checks. There's merits and disadvantages to both systems, but for now I think it's pretty unlikely for the MBTA or other northeastern "legacy" commuter railroads to shift away from conductor-based fare collection/inspection. The cultural/organizational change on large systems like these might be almost as difficult as installing TVMs at every stop on these far flung systems. There's nothing particularly special about the CharlieCard technology that distinguishes it from any other RFID system, and there's nothing (other than cost) that would inhibit the use of handheld RFID readers by onboard conductors to validate tickets loaded on the card. This is not either/or - you don't have to implement systemwide POP to put CharlieCards on the commuter rail. All you need to do, in fact, is outfit every conductor with a portable card reader - which is more than doable, and doable cost-effectively with technology in widespread use today. octr202 wrote: There's merits and disadvantages to both systems, but for now I think it's pretty unlikely for the MBTA or other northeastern "legacy" commuter railroads to shift away from conductor-based fare collection/inspection. The cultural/organizational change on large systems like these might be almost as difficult as installing TVMs at every stop on these far flung systems. Amtrak now has electronic ticketing nationwide. True, Amtrak conductors were not generally previously handling cash on-board on most routes, but there is no technological impediment to electronic ticketing on the commuter rail. 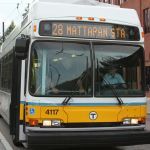 There's no way to sugarcoat it: it is clear that T management never had a concrete plan for rolling out Charlie beyond the bus and subway. And it's not even clear on the latter: just look at the unused validator machines that perpetually display Windows or database errors on some of the street-level Green Line stops. Perhaps an easier intermediate step would be to be able to buy CR tickets with a Charliecard. Walk up to a machine, tap your Charliecard, hit a few buttons, it spits out your ticket. That's easier to extend one station at a time, and it would transition easily to conductors with handheld validators later. Commuting Boston Student wrote: There's nothing particularly special about the CharlieCard technology that distinguishes it from any other RFID system, and there's nothing (other than cost) that would inhibit the use of handheld RFID readers by onboard conductors to validate tickets loaded on the card. This is not either/or - you don't have to implement systemwide POP to put CharlieCards on the commuter rail. All you need to do, in fact, is outfit every conductor with a portable card reader - which is more than doable, and doable cost-effectively with technology in widespread use today. It's not the giving the Conductors card readers that is the issue. It's the way the passengers need to add value to the cards. Without that infrastructure, the cards are useless. And that's where the cost comes into play. The future will be open-source fare media, such as pin-enabled bank-issued credit and debit cards. You'll have to tap in and tap out, just like is done all over Europe. This allows for a tremendous amount of flexibility in terms of fare structures. For those very rare situations where individuals don't have a credit/debit card, stored-media cards can be sold by vendors and/or machines. See here for an example. And here for a proposed standard. Just to clarify, the Caltrain system lets you go negative, the MBTA system could as well (just like DC does). On the systems that allow you to go negative. Do you have to the card registered(or pay for a card), or can you just let the card go in the trash and get a new one and not repay the negative balance? I know in Washington DC the cards are not free for example. Boston is always going to have free cards. DC charges $5. Originally, that was more than the most you could go negative with. I believe since the last fare hikes you COULD save money by using and discarding a card every day, but it was determined that such a small proportion of the population would do that it was useless to deal with. On Caltrain, the card is $3, youre required to have $1.25 on it when you start to avoid the issue of profiting off throwing cards away. What happens if you walk through an MBTA gate behind someone without tapping? What happens if you hit in a MBCR restroom while the train is in motion? That's what fines are for. You can do it, but as long as the fine is high enough, and fare checks are frequent enough, you wont. If you don't, youre caught 3 times. If the fine is $50, then $75, then $100, you've saved $24, and now you have to pay over $200. Diverging Route wrote: The future will be open-source fare media, such as pin-enabled bank-issued credit and debit cards. You'll have to tap in and tap out, just like is done all over Europe. This allows for a tremendous amount of flexibility in terms of fare structures. But that requires controlled access to the outlying stations, which is cost-prohibitive for a lot of North American commuter rail stations and inconvenient for passengers, especially for stations that are at-grade. For the 57th time, no it doesnt. No system puts "controlled access" at outlying stations because of the cost. If you dont tap out, you get charged the max fare. The incentive is to tap out to avoid that happening. If you dont tap in, you get hit with a large fine. Even the London Tube, which has barriers downtown, has no gates in the suburbs. jamesinclair wrote: No system puts "controlled access" at outlying stations because of the cost. And they have a lot of ticked-off customers who think they were unfairly fined. Over £60 million in fare disputes in a year. jamesinclair wrote: And they have a lot of ticked-off customers who think they were unfairly fined. Over £60 million in fare disputes in a year. Thats true of anything though. Traffic court is like its own sub-universe. People will contest red light running tickets when theres video showing them running a red light.